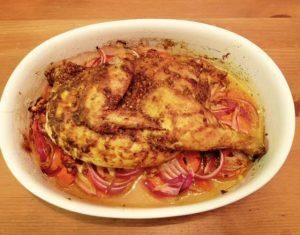 The first time I made this Moroccan Chicken recipe, I only roasted half a chicken over the veggies. It turned out perfectly. Optional addition: 2-3 drops high quality lemon essential oil for more intense lemon flavor. This is also works great if you're out of lemons and need the flavor. 2. Place carrots, onions, and optional olives in the bottom of a roasting pan. 3. Dry chicken with paper towels (because butter only sticks to dry chicken), set near roasting pan. 4. Combine butter with Moroccan Spice blend and optional lemon essential oil in a small bowl. Rub butter/spice mixture all over chicken, including between the skin and breast meat. Place chicken on top of vegetables. Squeeze lemon halves over the top of everything. Place garlic cloves and squeezed lemon halves inside the chicken. 5. Roast, uncovered, until thermometer placed between the leg and breast reaches 165 degrees, between 1 to 2 hours, depending on size of chicken (about 20 minutes per pound).